I wish they had taught me about ambivalence at medical school. It would have made my life immeasurably easier if I had understood it earlier. Instead I was quite a long way into my career before I really began to see how important it was both to my patients, and to me personally. I was taught what to do for each clinical problem with the expectation that a person would be ready, and willing, to accept my advice. If he or she wasn’t, they were something of a nuisance, indecisive, unable to recognise what was good for them. ‘Oh she’s ambivalent about it,’ I would be told if a person was shilly-shallying around. Ambivalence as a concept was confused with indecision. But it isn’t. It’s something much more than that. It’s about wanting to have something at the same time as not having it. Wanting to be thin, but to eat a large slab of chocolate every day. Wanting both the benefits of sobriety and inebriation. Even wanting to be both dead, and alive at the same time. I know from talking to people who have tried to kill themselves and failed, that they sometimes wanted to be both still here among the living, yet dead and out of their suffering too. Some of them changed their minds as soon as they had acted to end their lives and came to seek help. Ambivalence underpins so many of the problems people have brought to me, and my own difficulties too. I was an ambivalent medical student, and for many years an ambivalent doctor. I wanted both to belong to a profession and all the benefits that come with it, and not to belong because of the cost to me personally and emotionally. 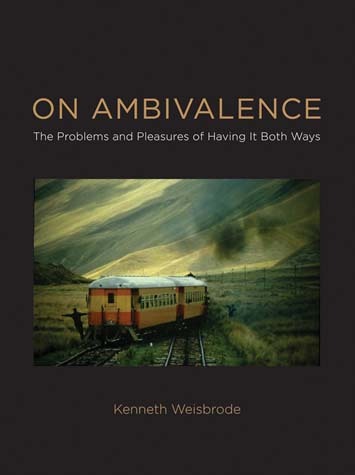 If you haven’t read Kenneth Weisbrode’s recent short book on the topic, entitled ‘On Ambivalence’ I can highly recommend it. The person who is ambivalent about their eating, or drinking, or lifestyle ( add ad infinitum) is not only unable to choose the from the options they have in front of them, but refuses somehow to admit that there is even a choice to be made at all. It’s both a painful yet oddly pleasurable place to be. We cannot have it all, but still somehow want to believe that we can. We don’t have to decide what to do, to change our lives, because there isn’t a decision to be made. Yet we suffer because we struggle to live what is an impossible existence, only we don’t admit how impossible it really is. We may say it doesn’t happen quite like now, but it does. A person who doesn’t see the need to make a decision about taking up therapy and attends only intermittently is rapidly discharged for being unmotivated. Instead of trying to understand their ambivalence and empathising with the problems they are experiencing which make it impossible for them to contemplate a decisive response to their problems, we treat them as wasting our time. When he first described Motivational Interviewing, Miller emphasized the responsibility of the therapist in helping the client to acknowledge and explore their ambivalence. When the person is ‘unmotivated’ we are discharged, as therapists, from our responsibilities. I was personally fortunate. I had a therapist who was prepared to engage me in acknowledging that I both wanted to succeed and to fail in my career, and ultimately to both to live and to die. I’m still ambivalent, but I don’t want to talk about that now. There isn’t time. My cat is currently driving me crazy, wanting to be on both sides of the back door at once. Now that’s ambivalence.